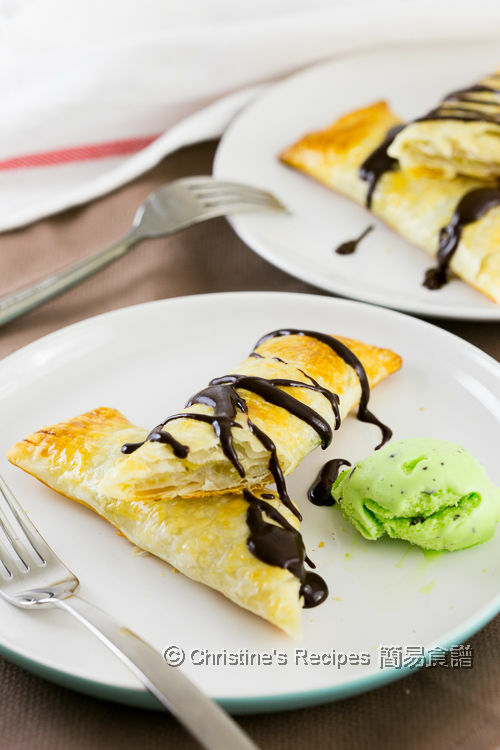 Ever tried this simple banana pastry with chocolate sauce that's quite popular in Hong Kong? This recipe was suggested by my sister when she traveled to Australia and visited me. She said she tried this dessert, banana pastry at a dessert café in Hong Kong. Immediately I baked one for her, that only took me just half of an hour. It’s really yummy and easy to make. The hot banana inside the pastry with smooth chocolate sauce tasted heavenly. Who can resist the temptation of ice-cream as well? Put the dark chocolate, whipping cream and sugar in a small sauce pan. Don’t need to bring it to boil. Just heat until the chocolate and sugar are melted. Stir consistently. Set aside. Preheat oven to 180C / 350F. Rest puff pastry at room temperature. Slice bananas. Cut the puff pastry into two halves lengthwise. 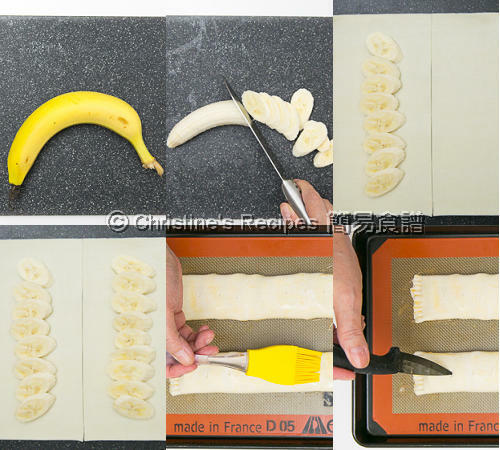 Wrap the banana slices in the middle of each half of puff pastry. Use a fork to press and seal both ends. Brush whisked egg on the surface. Prick the surface with a sharp knife or fork. Bake in the preheated oven for 20 minutes, or until golden brown. Serve with chocolate sauce and favourite ice-cream. To get the best results, use ripe bananas. They’ll turn into sweet and creamy fillings. You may use any favourite fruits instead of ice-cream. Yumm!!! I bet instead of only chocolate sauce, dipping that in some Nutella would taste Ah-Mazing. Great post! That's what my sister said to me, "banana and chocolate are good friends..."
Yeah, good idea. My daughter asked me to cook her some desserts with Nutella the other day. She's a BIG fans of it. Hi, this is great and yummy! How amazing does that sound....I LOVE banana everything especially when it involves dessert - YUM! Yeah, we all love it. Fantastic! Banana is a very healthy food too. That look so delicious! I love anything with pastry puff and so are my kids.Love it! Yay, another puff pastry fans. Welcome you. Hey Christine, I have passed on The Kreative Award to you. Hi, may I know where did you get the 1/2 puff pastry? I'm always up for bananas and chocolates! With puff pastry sounds even better! It's half of a piece of frozen pastry, about 12cmx24cm. But you can use any size of pastry you like. Yeah, wonderful combination. My family loves this dessert very much. This dish won't be too heavy though. I made this for my kid's class, but added bacon wrapped around the banana and they loved it. 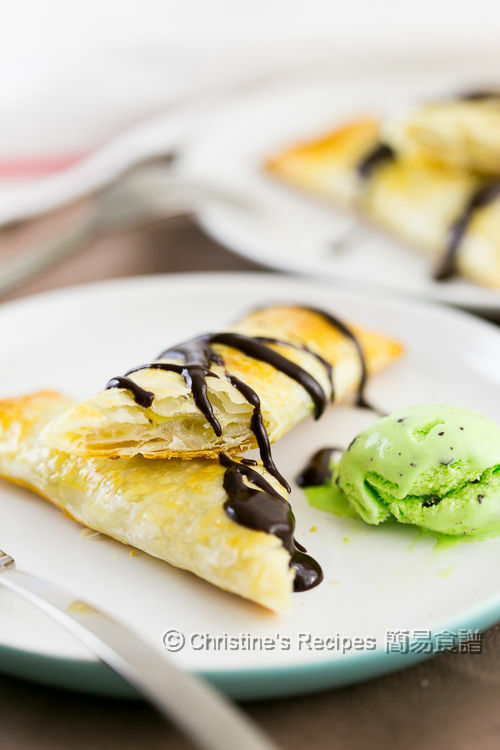 Hi can you tell us the recipe to make the puff pastry? thanks! I just used the store-bought puff pastry for convenience. Looks yummy! What is the brand of the puff pastry that you are using? I used Pampas puff pastry, available at any supermarkets. Hi Christine, may i know what brand of whipping cream you are using. Sometimes I use Paul's, sometimes I use Coles brand.